MrRodgers had the most liked content! Very true. The only major obstacle is off the departure end of 24 where there is a 600 + FT radio tower that needs to be respected. The video is tragic in every way. I guess the moral to that story is SEIZE THE DAY! Good for him for getting it done at 89. 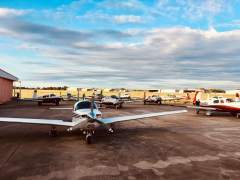 Welcome to the West Coast Mooney Club! Look forward to meeting you at our upcoming events. Relegated? I prefer the term "fortunate" to be in the vintage category. There is just something about a well maintained vintage anything that always gets my attention. In truth the extra 10" added to the F and later airframes was divided between both the front and rear seats. At 6'3" 225lbs I am very comfortable with my plane solo or with passengers. It was great seeing you and your wife last Sunday. Hope to see you both again very soon. Oceano fly-in coming up May 10-11.